The incredible true story of rodeo cowboy Ron Woodroof’s battle with HIV and with the Food and Drug Administration (FDA) is one that deserves to be told on the big screen. After a few false starts and years of effort and determination, director Jean Marc Vallée has brought the project to fruition. 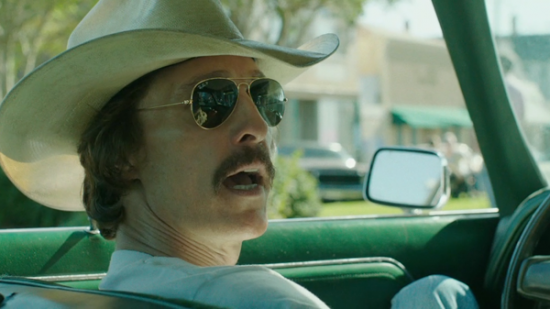 Matthew McConaughey stars as Woodroof, continuing his remarkable run of form, and gives an awe-inspiring performance. After an accident at work hospitalises Woodroof, he is told he is HIV-positive and given around thirty days to live, but he refuses to give in and accept his cruel fate. He has a thirst for life, as well as bourbon, and his survival instincts lead him to start the ‘Dallas Buyers Club’, where he smuggles drugs into the country and distributes to fellow sufferers including Rayon (Jared Leto), with whom an unlikely friendship is formed. Never has the term ‘actor’s film’ seemed more apt, as the underlying narrative structure is rather conventional, broken down with days after diagnosis title cards, allowing us an idea of the passing of time and offering a platform for Woodroof’s character arc. Initially homophobic and misogynistic, he is a nasty piece of work but as his condition develops, his narrow-minded outlook on life expands to show courage and compassion as he fights not only for his own life but the lives of all that sign up to his money-making membership club. He recruits Rayon as his right hand woman/man, a flamboyant opportunist with an ever- worsening cocaine addiction. Both turns are transformative, and at times very touching, and are receiving justifiable critical acclaim. Their gaunt frames tug at the heartstrings of the audience, inducing tears and laughter, uniting through adversity. The pharmaceutical discussions are enjoyable, as Ron swirls through legal loopholes to keep his entrepreneurial enterprise intact but aside from the superb acting, there isn’t an awful lot to shout about. McConaughey himself said proudly that this quickly becomes much more than the ‘McConaughey gets skinny’ film, and I suppose he is right. His portrayal is full of energy and magnetism, pushing the weight loss out of the limelight, though he did shed an amazing 38 pounds for the role. It rounds off the much publicised ‘McConaissance’ which has seen him shrugging off his flimsy rom-com rep to impress in Killer Joe, Mud, Magic Mike, and now this. He will also be at the centre of Christopher Nolan’s next picture which is set to be one of the year’s biggest talking points. Proving himself, he shows great dedication and respect for Ron Woodroof in ‘Dallas Buyers Club’, carrying the film to a very solid standard. This entry was posted in DVD and tagged dallas buyers club, jared leto, matthew mcconaughey. Bookmark the permalink.